Bobbie Gentry notches her third week at #1 with "Ode To Billie Joe" as Diana Ross and the Supremes move into the #2 spot with "Reflections", up from #4 the previous week. "Come Back When You Grow Up" by Bobby Vee continues its climb up the chart, moving from #8 to #4 this week … and "The Letter" by The Box Tops jumps another ten places from #15 to #5. "Apples, Peaches, Pumpkin Pie" by Jay and the Techniques is the only other bulleted Top Ten Record this week, climbing from #13 to #7. Outside The Top Ten, Eric Burdon and the Animals climb eight places from #21 to #13 with their latest, "San Franciscan Nights". Donovan is up seven spots (from #23 to #16) with "There Is A Mountain", Wilson Pickett climbs five spots (from #22 to #17) with "Funky Broadway), The Turtles are up eight (from#26 to #18) with "You Know What I Mean" and Van Morrison's "Brown Eyed Girl" climbs from #25 to #20. Jackie Wilson's latest hit keeps climbing "Higher And Higher" … it's at #22 this week, up from #29. Right behind it is Paul Revere and the Raiders and "I Had A Dream" (#31 to #23). 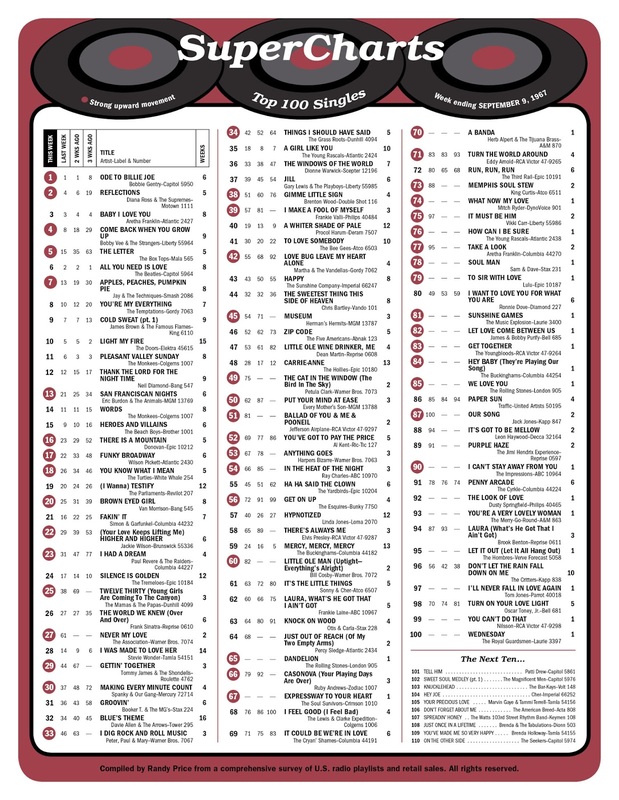 The Mamas and the Papas continue to climb up the chart as "Twelve Thirty" moves from #38 to #25 … and The Association make a HUGE leap this week from #61 to #27 with their latest, "Never My Love". Tommy James and the Shondells climb fifteen places (from #44 to #29) with "Getting' Together", "I Dig Rock And Roll Music" by Peter, Paul and Mary climbs up seven spots, (from #46 to #33), "Things I Should Have Said" by The Grass Roots finally cracks The Top 40 at #34, "Gimme Little Sign" by Brenton Wood jumps from #51 to #38 and Frankie Valli looks to have another solo hit on his hands as "I Make A Fool Of Myself" climbs from #57 to #39. Suffice to say that the times, they have a-changed!!! Save for the out of place Engelbert Humperdinck disc, that's some pretty heavy music up there at the top of the charts … and there's still room for the pop sounds of The Monkees and The Association, the soul of Aretha Franklin and The Temptations (and, to a lesser degree, The Young Rascals), plus the new heavy sounds of Jefferson Airplane, The Doors and The Rolling Stones. Michigan Governor Romney told a television interviewer that he had been brainwashed by US officials during a trip to Viet Nam in 1965, thus forever damaging any chance of an intended presidential run for the Republican Party.